The Linux kernel will usually be installed with its usb and usbserial drivers available as automatically activated modules. Alternatively, they may be built into the kernel if desired. The library libusb will also usually be installed. Also available in the Linux kernel source is a serial driver for devices that use the FTDI USB interface chips. This driver, called ftdi_sio, might not be included in your Linux kernel binary. If not, recompile the kernel from the Linux source code and select "Device drivers->USB support->USB Serial Converter Support->USB FTDI Single-Port Serial Driver" (CONFIG_USB_SERIAL_FTDI_SIO). The driver blurb says "single-port", but in fact, it works with the dual-port FT2232C chip. When an FTDI-based USB device is plugged in, the system binds the ftdi_sio driver to it. The driver then creates /dev/ttyUSBx ports (major device number 188) which an application can use for input and output just like a standard serial I/O port. The USB nature of the communication is hidden from the application as data is exchanged between the device and the application program. All USB devices, whether serial or not, automatically acquire a device entry under /dev/bus/usb/00*/*. These entries have typically have major number 189 and a minor number corresponding to the next available USB device number. The current version of ftdi_sio, however, only allows access to the chip's UART modes. It does not allow bit-banging or access to the associated user EEPROM. A library called libftdi bypasses the ftdi_sio driver and directly accesses the Linux USB core drivers via another library called libusb. Using libftdi, one can do bit-banging and read/write/erase the user EEPROM attached to the FTDI USB chips. libftdi, however, needs to be downloaded, compiled, and installed as described below. I have modified it to better handle the FT2232C chip. You may want to try my versions of ftdi.h and ftdi.c, but keep in mind they are still a work in progress. Convenient development assemblies using the FTDI chips are produced by DLP Design. Their DLP-2232M-G USB Adapter is a 40-pin DIP board with the FTDI chip, a clock crystal, 256-byte EEPROM, some power control circuitry, and a USB connector. Their DLP-2232PB-G USB Adapter adds a Microchip 16F877A microcontroller to this and mounts it on a small 50-pin printed-circuit board. The 16F877A is pre-coded to allow A/D conversion, bit I/O, and the sensing of DS18S20 "1-wire" chip thermometers. scope.h which displays analog and digital data from the sensing pins of the 16f877a microprocessor in the DLP-2232PB-G protoboard. thermometers.h which drives an enhanced set of commands for monitoring the DS18S20 and DS18B20 thermometers. These routines are multi-threaded to allow overlapping of thermometer reading. mavica.h which drives a set of commands that allow remote control of a Sony Mavica CD-500 camera. These are demonstrated by scope.c, temperature_monitor.c, and mavica.c. I run thermometer_monitor.c as a cron job with its output redirected to a temperature log file. 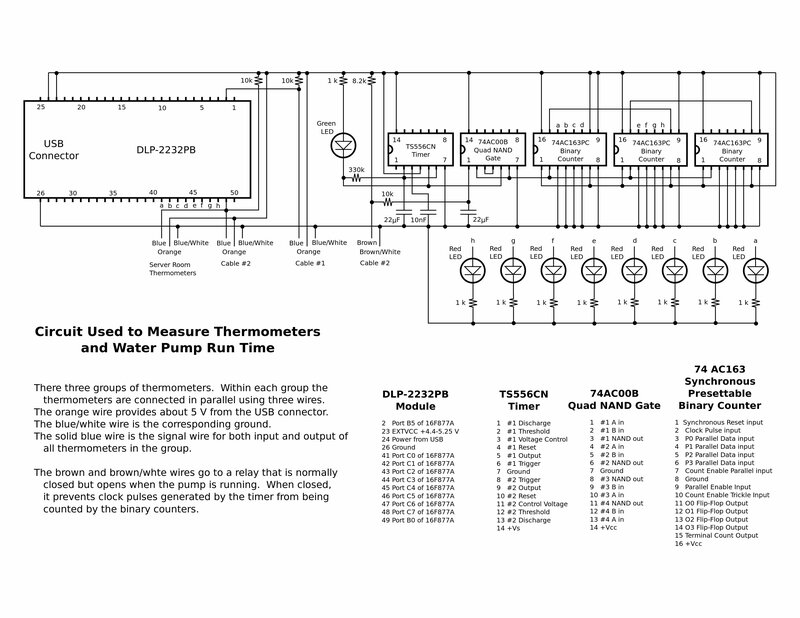 The circuit arrangement for checking temperatures and pump run time is here. The scope.c program produces displays of both analog voltage changes and simultaneous monitoring of 8 digital signals. The original code in the 16F877a only made one reading per command. 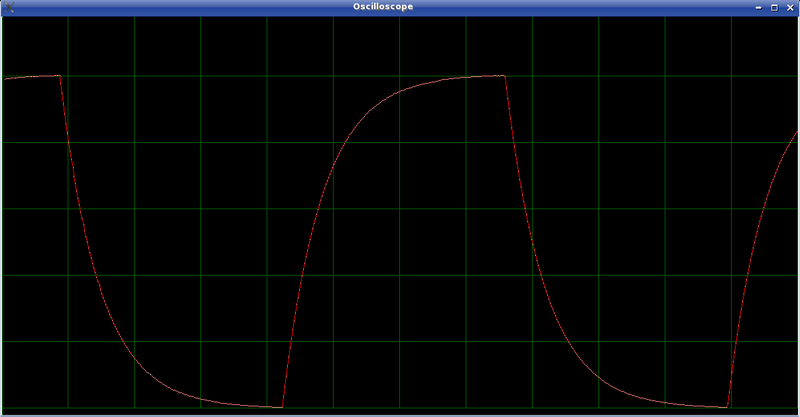 To make a useful oscilloscope, my modified code makes bursts of readings for each command. This was useful for analyzing the communication between my Mavica CD-500 camera and its remote and another DLP-2232PB-G programmed to behave like the remote. I am currently monitoring 35 temperature sensors with the temperature_monitor.c program. It determines what thermometers are present and gets their readings in 2 seconds. I run it every 15 minutes as a cron job. The assembly code is compiled and linked using the gputils tools, and loaded into the DLP-2232PB-G using this C program which uses the in-circuit programming capability of the DLP-2232PB-G. When studying this oscilloscope demo program, pay close attention to how the serial I/O is set up. The DLP-2232PB-G has responses of predictable length, but no termination character. It is therefore crucial to open the serial communication in asynchronous mode with signals used to flush the responses from the USB subsystem to the application read statement. The system call select() is used to allow a timeout of the read() calls. The original "oscilloscope" program without bursts of readings had irregularities caused by the multi-tasking of Linux. These were minimized by running as root and adjusting priority by doing nice --adjustment=-20 ./scope. Alternatively, the C-library routine nice() can be placed around the time-sensitive data collection code. The version that uses bursts does not have this problem because its measurement timing is determined by the instruction loop in the PIC16F877A chip. Also, there is much less 2-way traffic on the USB bus and the system buffering is able to hide the effects of system multi-tasking. A further refinement is to use separate execution threads for parts of the program that might cause delays, like the scope display and thermometer reading routines. This describes directly connecting a FT2232C chip to an D/A chip, a A/D chip, and a buffer to drive LEDs and relays. The DLP-2232PB-G Data Sheet has the circuit layout for how it combines the FT2232C to the PIC16F877 as well as how to utilize the demonstration embedded code inside the PIC16F877A. That code allows one to read analog voltages, read/set digital voltages, read single-wire thermometers, and read/write the user EEPROM (not to be confused with the EEPROM connected to the FT2232C chip that we must use libftdi to access). The FTDI documentation of the FT2232C chip only describes its hardware. Its firmware, unfortunately, is poorly documented. They expect users to use Microsoft drivers and their programs that only run on Microsoft systems. Here is my attempt to collect documentation of the FTDI chip commands. The PIC16F877A microcontroller chip is fully documented, but be sure also to look at their erratum. Maxim's documentation of their DS18S20 single-wire chip thermometer is also complete. The USB 2.0 Standard document is crucial to understanding the details of USB interfacing. The protocols, descriptors, and many other important details of the USB 2.0 standard are described in this 650-page document which can be downloaded from USB Implementers Forum, Inc.. The first 5 chapters and Chapter 9 are particularly relevant to USB programming. Downloaded libftdi-0.8.tar.gz from Intra2net, placing it in an empty directory. Adjust the version numbers as needed. As of June, 2012, 0.8.0 needed to be replaced with 1.20.0 and so.0 needed to be replaced by so.1 to match libftdi-0.20.tar.gz. If you get an error message like "configure: error: *** libusb-config not found. You need a working libusb installation. ", you need to install libusb-dev by doing apt-get install libusb-dev as root. To run this bitbang example, first inspect its code to see if it has the correct vendor_id and product_id for your device. (lsusb -v reveals these.) Edit accordingly. I needed to change product_id from 0x6001 to 0x6010. If you get an error messages stating unable to open ftdi device: -3 - device not found, you probably still don't have the correct vendor and product numbers. If your device can not be found using lsusb -v, then check to see if it is plugged in and the pins 17-20 on the DLP-2232M-G are connected correctly for selecting power. If you get a message	ftdi open succeeded: -5 followed later by some write failed for 0x0, error -22 - usb bulk write failed messages, other drivers are claiming control of the device. In my system, the usbi_sio driver was claiming the board until I changed the product id. Here, the 3-3:1.0 and 3-3:1.1 numbers are the names of links found in that same directory that shows which devices are bound to the ftdi_sio driver. If your ftdi_sio driver is a module, you simply do rmmod ftdi_sio to unbind it. 00000090   00 00 00 00  00 00 16 03  44 00 4C 00  50 00 20 00  ........D.L.P. .
000000A0   44 00 65 00  73 00 69 00  67 00 6E 00  16 03 44 00  D.e.s.i.g.n...D.
000000B0   4C 00 50 00  2D 00 32 00  32 00 33 00  32 00 50 00  L.P.-.2.2.3.2.P. 000000C0   42 00 12 03  44 00 50 00  34 00 30 00  4D 00 39 00  B...D.P.4.0.M.9. 000000F0   00 00 00 00  00 00 00 00  00 00 00 00  00 00 75 B0  ..............u.
Two-byte data (manufacturer id, product id, USB version, and Unicode characters) are 16-bit words which are stored with the low byte lower in memory. A descriptor string, however, is sent out from memory going from low address to high address and these 16-bit words must be reversed when sent out in order for the computer to receive them in low-order byte first. Bit 3: Virtual COM Port?? high byte of 05 for 2232? bit 4 set to direct use of USB Version number provided here. If not set USB Version 2.00 will be used. The string data that follows is placed starting at address 0x14 in earlier chips that had only a 128-byte EEPROM, but must start at 0x96 in the FT2232C chip which has a 256-byte EEPROM. Last 2 bytes of 256 (128 in earlier chips) must be the checksum, low byte first. The FTDI-2232C sets its language Id to 0x0409 (US English) in ROM. It cannot be changed. Of course, certain settings must be modified to match your system. When the EEPROM settings are changed, they are not put into effect until the unit has been reset either by using the RSTIN (pin 27 of the DLP2232M-G, pin 4 of the FTDI2232C) or by unplugging and replugging the device. It is a good idea to make sure that the bitbang2232 example described above works correctly to be sure that the library and device are talking to each other, before changing the EEPROM. The Linux USB Project has a great deal of useful information for programmers of USB for Linux. The cat 3-3/power/wakeup will return enabled if the DLP2232M-G has "wakeup on suspend" enabled in its EEPROM. You can take it out of suspend by echoing a 0 into 3-3/power/state. Temporarily forcing the DLP2232M-G pins <SI/WUA> or <SI/WUB> or UART ring indicators to a low voltage state will also take it out of suspend. Of course as before, 3-3 was my device code, yours will likely be different. Also, if you had made the power directory your working directory, you would have found a somewhat confusing result since that directory will be removed and recreated on a different filesystem inode number when the power condition is changed. Similarly, if the device is disconnected and reconnected, the 3-3 directory will be recreated on a different inode. If "wakeup on suspend" is not set in the DLP2232M-G EEPROM, cat 3-3/power/wakeup will simply return a blank line. Unplugging the device. When plugged back in, the driver will automatically be bound again. Momentarily holding the reset pin (DLP2232M-G pin 27, FTDI2232C pin 4) low. When released, driver will rebind. The device link for the DLP2232M-G, 3-3 in this example, disappears when unbound. Be sure you have identified the right device link. Doing cat 3-3/id* will show the product and manufacturer id numbers for device 3-3. Since this removes the /sys/bus/usb/ entries for the device. You cannot selectively rebind it using /sys; you must unplug and replug the device. It might be possible to force the system to look for devices again, but I am not sure how. Compiling the Linux kernel with CONFIG_USB_DEBUG set will cause USB activity to be logged to /var/log/kernel/info. This can be very helpful. I edited /etc/syslog.conf so that the kernel debug logging would be sent to /var/log/kernel/debug. This prevents the normal log files from being filled with the massive debug information. Both of these, of course, can be turned off again by echoing 'N' into the pseudofile. libusb is the core library of routines that handle the USB 2.0 Protocols in Linux. Other specialized drivers and user programs work through it. libftdi routines are simply functions specialized for the FTDI chips that call libusb routines. Java is a great language for writing GUI code. These notes describe how to get a Java program to access the ftdi and usb-sio library code.